Select New metric > Create a recipe. In the form, select Comparison. 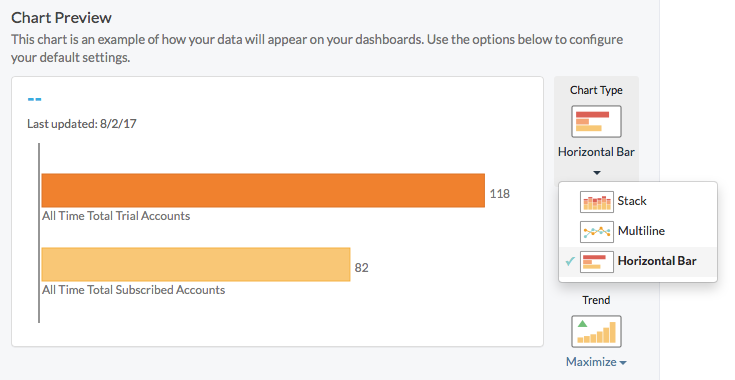 Select the metrics you want to compare from the list. You can select an existing metric from the drop-down menu or create a new manually updated metric by typing in a name and email of the person who will update it. Select the option to view your metric as a stack, multiline, or horizontal bar chart. If you choose horizontal bar chart, the most recent interval will be shown, rather than showing the trend over time.